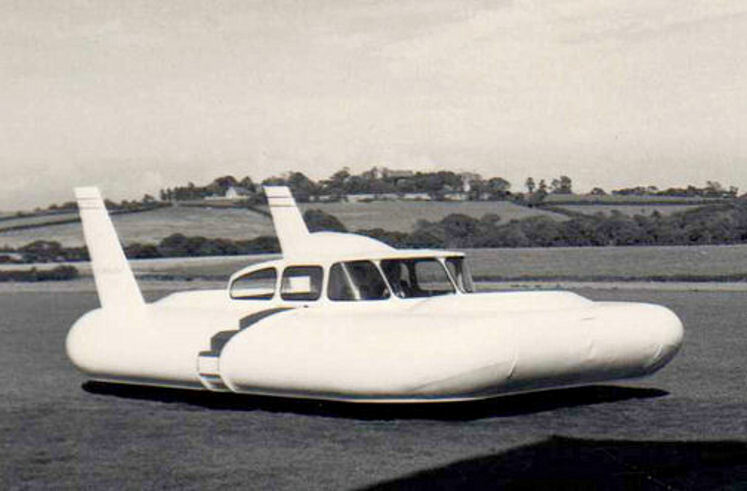 The first craft in the series was built by Britten Norman in 1960 as "The Cushioncraft", subsequent a separate company was formed (Cushioncraft Ltd) as a division of Britten-Norman Ltd (manufacturer of aircraft) and the first craft was renamed CC1. 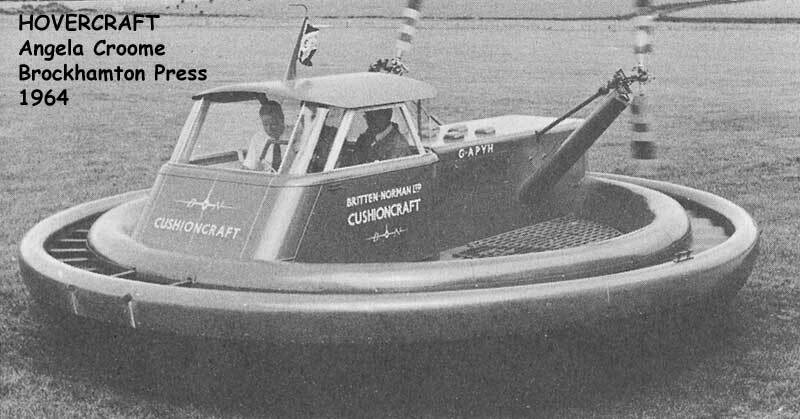 Originally based at Bembridge Airport on the Isle of Wight, Cushioncraft later moved to the Duver Works at St. Helens, these works gave ready access to the sheltered water of Bembridge Harbour. 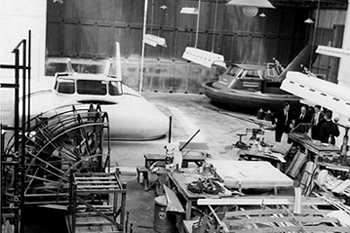 The Britten-Norman 'factory' (hanger) on Bembridge Airport circa 1961. CC1 at right/back, CC2-001 left - John Britten left in group. 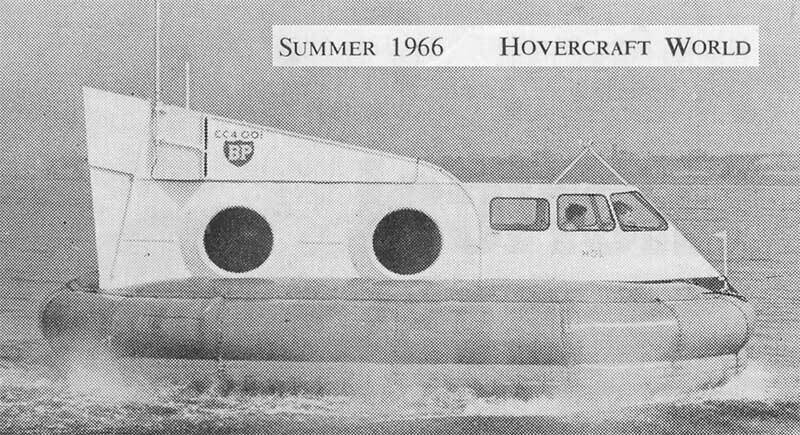 In 1971, Britten-Norman encountered financial problems, and one result was that the Cushioncraft company was sold in 1972 to the British Hovercraft Corporation. 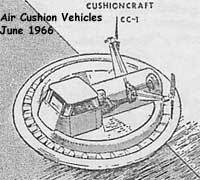 After Cushioncraft was taken over by BHC, the 'unique' fan lift/propulsion arrangement design of the later quiet Cushioncraft vehicles was allowed to quietly slip into history. The Duver Works has since be used by Hovertravel/Hoverwork (more recently Griffon Hoverwork) as a maintenance centre. 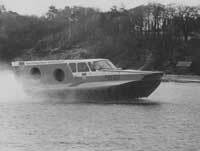 During the 1980s/90's the Duver Works was used to fit out the AP1-88 craft and BHT series produced by Griffon Hoverwork. In 2012, Griffon Hoverwork transferred production from the Duver Works to their facility at Woolston on the River Itchen. 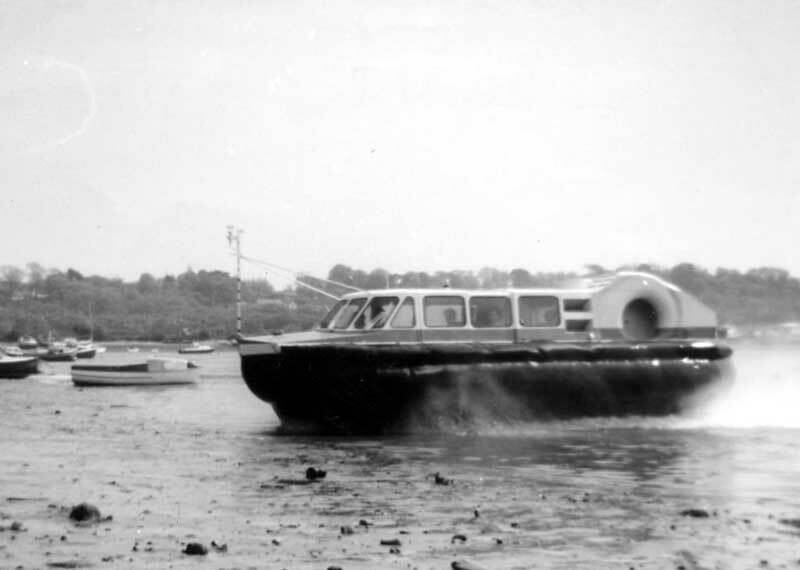 The 'second' hovercraft to lift off the face of the earth in June 1960 - note the lift 'fan' running around the craft - I guess you would have to watch how you stepped onto the craft if you wanted to keep your feet ! 160 hp Coventry Climax engine driving both the propulsion rotors and the lift fan.
" I saw the 1st flight of the CC1 and it was a great and very humorous occasion! It took off with about six guys all round the outside with ropes to steady it. "When they eventually let go - it spun round and round down the slope of the land. They then had to get a huge crane from somewhere on the island to get it back into the hanger. "This crane had very many trips to Bembridge Airport over the months. " 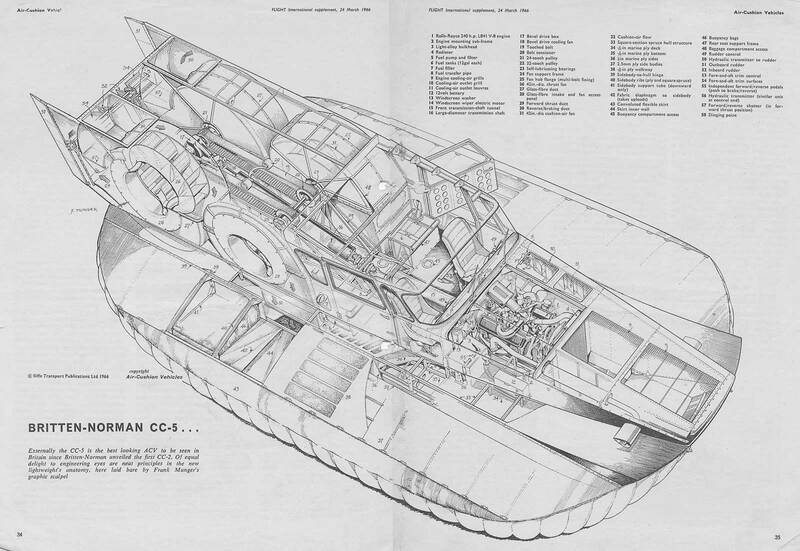 CC1 showing its ground clearance (12 to 15 inch). Desmond Norman at the control, John Britten left and Peter Gatrell right. Note the 'landing' wheels just visible underneath. 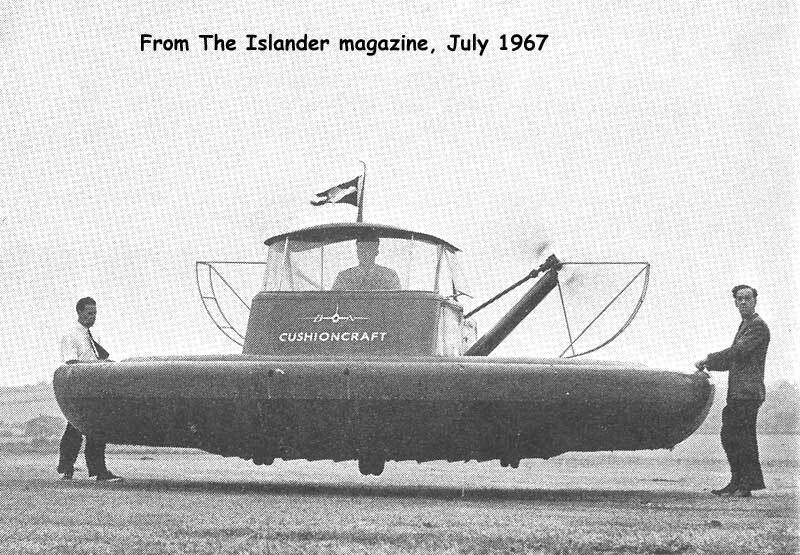 Originally designed and built (1st test flight September 1961) without a skirt and using air deflection within the cushion for propulsion, the CC2 was heavily developed over the years with the addition of a skirt and two external engines each driving a propellor for propulsion. The 'bodywork' was also heavily modified. Pathe 1963 video clip ofl CC2-002 + a longer video clip of out-takes. 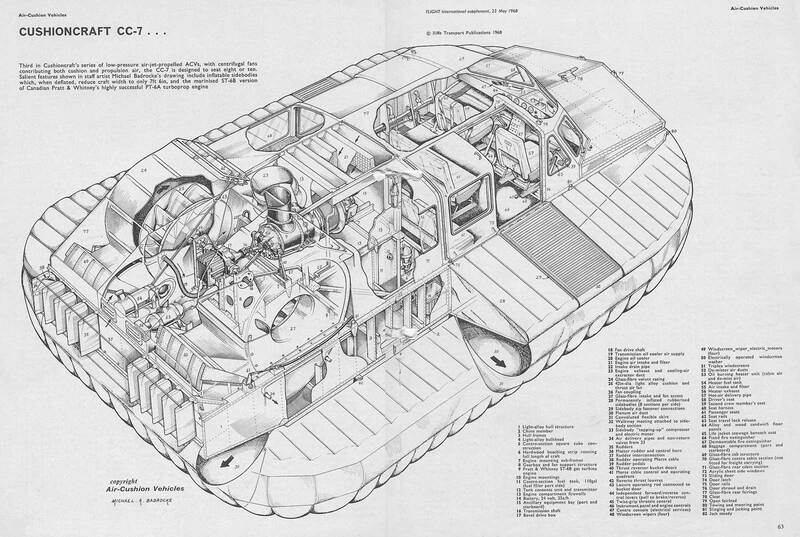 Developed by Cushioncraft jointly with Hovercraft Development Ltd, the CC4 was intended to be the first car sized craft to be put into production - this never happened. 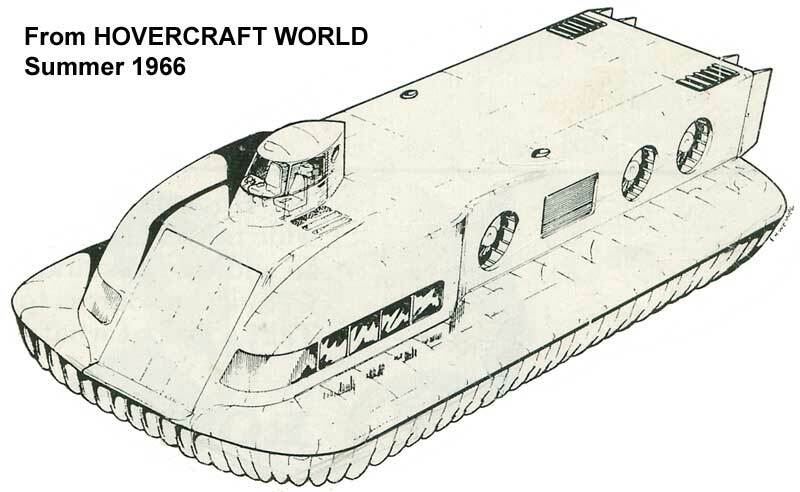 Subsequent to development use by Cushioncraft, the CC4 was sold to the NPL for future research, NPL renamed it HU-4. 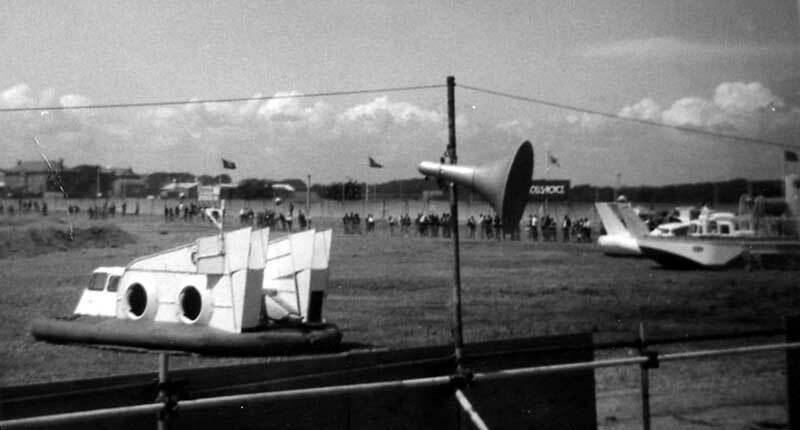 Lower picture, the CC4 at the Hovershow66. Only one was built (first flight March 1966), and during tests off of Priory Bay it capsized and was written off in October 1966. The CC5, together with an SR-N6, was used in the 1967 released Matt Helm thriller "Murderers' Row" staring Dean Martin. 4 x 3foot 6inch dia centrifugal fans giving both lift and propulsion. YouTube video clip from "Murderers' Row" showing CC5 chasing SRN6 around the Solent. 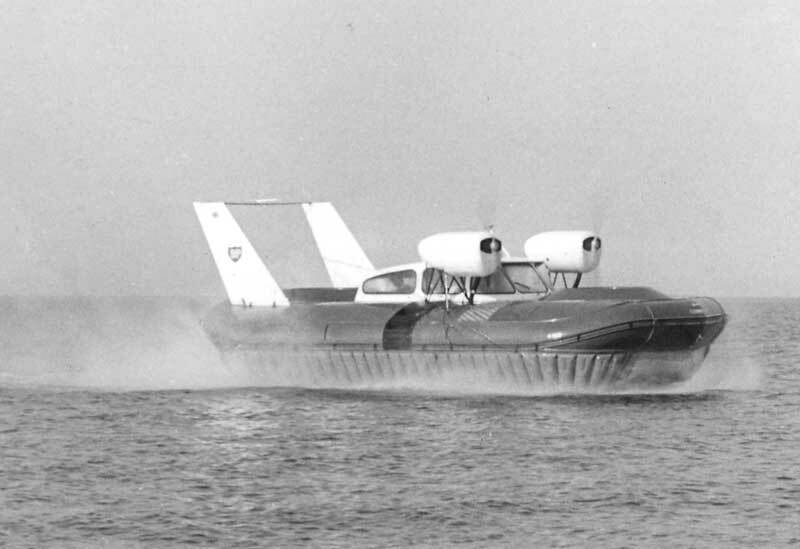 Although never produced, a CC6 design was produced circa 1966, this was a small vehicle/passenger craft (4 to 6 cars and 30 to 40 passengers) using the quiet centrifugal fan configuration for lift and propulsion developed from the CC4 and CC5. A development of the CC5, the CC7 was built in aluminium with inflatable side decks, first flight early 1967 - it was the first Cushioncraft to use a gas turbine engine (all previous having piston engines). A stretched version offering 17 passenger places was proposed after the company was taken over by BHC.